Preoperative percutaneous transhepatic portal vein (PV) embolization was first introduced in 1986 in hepatocellular carcinoma patients before hepatic resection. Preoperative PV embolization using the percutaneous transhepatic approach is now performed in patients with hepatocellular carcinoma, intrahepatic cholangiocarcinoma, and hilar cholangiocarcinoma receiving extensive liver resection including right hepatectomy or extended right hepatectomy., The embolization of the portal venous branch of the hepatic segments to be resected can redirect portal blood flow to nonembolized hepatic segments. The treatment induces atrophy of the embolized lobe to be resected and causes compensatory hypertrophy of nonembolized remnant hepatic segments. As a result, this preoperative management increases remnant future liver volume and prevents postoperative hepatic failure. Preoperative PV embolization is safe and effective before major liver resection. Linear echoendoscopy has been used to image the portal venous system and EUS-guided vascular intervention has expanded to include PV intervention.,, EUS-guided PV intervention has several advantages over the conventional percutaneous approach. 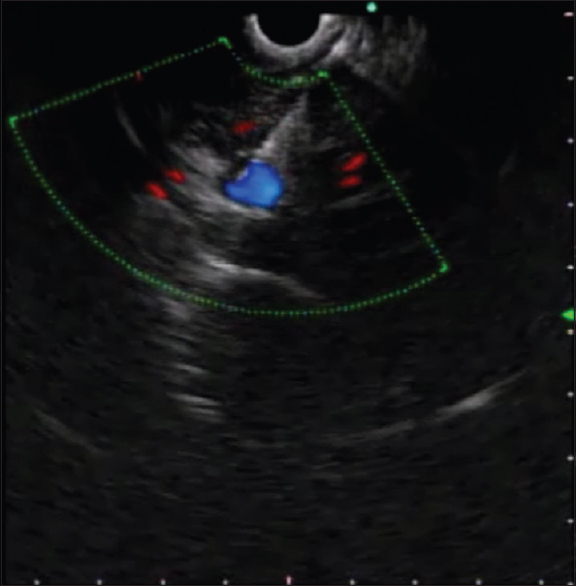 EUS provides detailed images of the portal venous system and both color Doppler, and pulsed-wave Doppler can give real-time blood flow characteristics and delineate vascular structures.,, Furthermore, the use of color Doppler EUS reduces the risk of nephrotoxicity from contrast and exposure to radiation. Preoperative PV embolization is currently performed by vascular interventional radiologists through the percutaneous transhepatic approach. The aim of this study is to evaluate the technical feasibility and initial safety of EUS-guided selective PV embolization using a coil and cyanoacrylate in a live porcine model. Nine male minipigs (Sus scrofus domesticus) (12 months old; 30 kg) were used for the experiments. Food was withheld for 48 h before the procedure. The pigs received only clear sugar-sweetened water for gastric preparation. All procedures were performed under general anesthesia provided by a qualified veterinarian. The pre-anesthesia medication included intramuscular injection of atropine sulfate (0.05 mg/kg), tiletamine hydrochloric acid (HCl) plus zolazepam (7.5 mg/kg; Zoletil ®; Virbac animal health, Fort Worth, Texas, United States), and xylazine HCl (1–2 mg/kg; Rompun ®; Bayer HealthCare, Lerverkusen, Germen). The animals were intubated with a 6.5 mm endotracheal tube (Well Lead Medical Co., Guangdong, China). General anesthesia was maintained with 1.5% isoflurane (Forane ®; JW Pharmaceutical, Korea). The animal blood pressure, heart rate, respiration rate, and arterial oxygen saturation were monitored continuously during anesthesia. This animal study was approved by the Research Animal Care Committee of Asan Medical Center. This study used an anterior oblique-viewing linear array echoendoscope (GF-UCT240; Olympus Medical Systems, Japan) with an EUS processor (EU-ME1; Olympus Medical Systems, Japan). The echoendoscope was advanced into the stomach before the intrahepatic PV branch was identified by EUS and color Doppler at a frequency of 7.5 MHz. 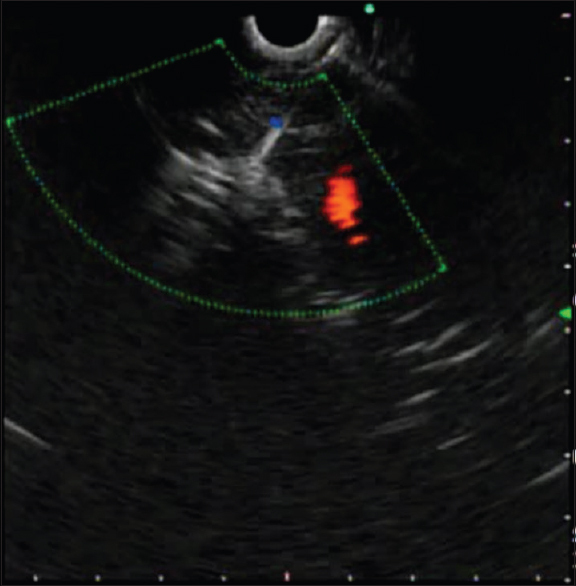 The PV was distinguished from the hepatic vein by its thickened hyperechoic wall on EUS view. 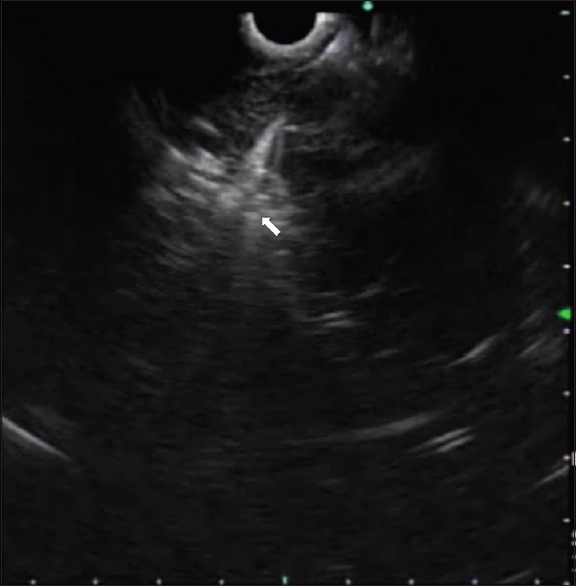 The blood flow in the intrahepatic PV was confirmed by color Doppler EUS. The embolization coil used in this study was a pushable helical coil (Nester ®; MWCE-35-14-12-NESTER; diameter inch 0.035 inch, extended embolus length 14 cm, coiled embolus diameter 12 mm; Cook Medical, United States). The adhesive liquid embolic agent used in this study was cyanoacrylate (Histoacryl ®; N-butyl-2-cyanoacrylate; BRAUN Aesculap, Germany). Before beginning the procedure, the helical coil was preloaded into the distal end of a 19G fine-needle aspiration (FNA) needle (Expect™ 19 ga Flex Needle; Boston Scientific Co., Natick, MA, United States). The selected intrahepatic PV was punctured with the FNA needle under EUS guidance, and then, the embolization coil was inserted into the selected intrahepatic PV using a stylet pushing device. We then immediately injected 0.5 cc cyanoacrylate through the same FNA needle, which was followed by 0.8 cc ethiodized oil (Lipiodol ®; Guerbet, United States) and 1 cc saline to prevent early clogging and leakage of cyanoacrylate in the FNA needle. 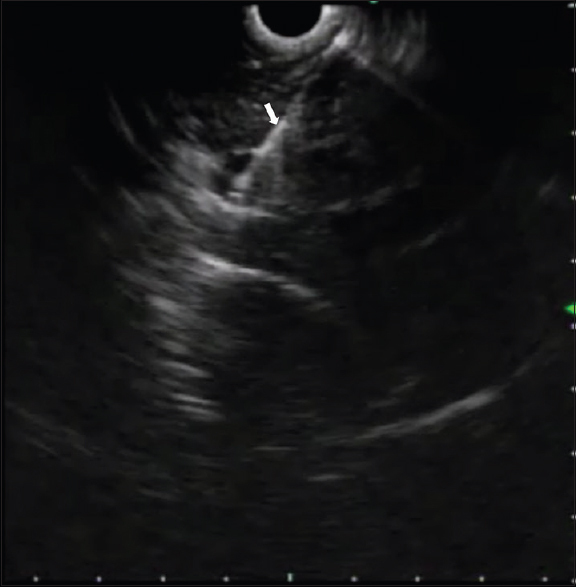 After completing the coil and cyanoacrylate delivery, we monitored the change of blood flow in the embolized intrahepatic PV branch using color Doppler EUS. The echoendoscope was removed after confirming there was complete blood flow block. The animals were monitored for procedural, immediate, and delayed complications. During the endoscopic procedure the blood pressure, heart rate, respiration rate, and arterial oxygen saturation were monitored (procedural complication). After the endoscopic procedure, the animal was monitored closely for 2 h to identify sudden or fatal complications (immediate complication). The animals were then observed for 1 week to assess delayed complications. The animals were euthanized after the 1-week observation period using intravenous potassium chloride under general anesthesia. The injection was performed by a qualified veterinarian, and the animals were necropsied to evaluate the damage to the embolized intrahepatic PV and other intra-abdominal organs. The branch of the intrahepatic PV was identified by EUS and color Doppler [Figure 1]. The EUS-guided puncture of the intrahepatic PV branch was successfully performed without difficulty using a 19G FNA needle in all nine animals [Figure 2]. The embolization coil was placed successfully into the selected intrahepatic PV in 8 of 9 animals (8/9, 88.9%) [Figure 3]. In 1 case, the embolization coil migrated into the hepatic parenchyma and was not located in the selected intrahepatic PV. The cyanoacrylate injection was successful in 7 animals (7/8, 87.5%) [Figure 4]. In 1 case, the cyanoacrylate injection failed due to early clogging of cyanoacrylate in FNA needle. 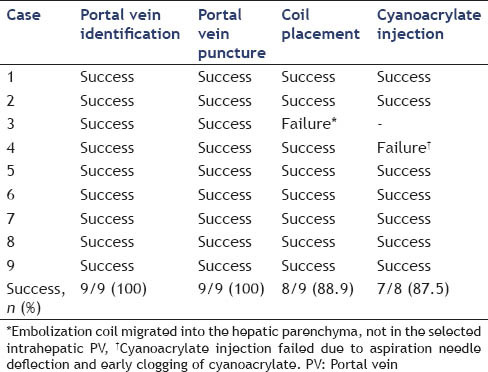 The feasibility results of EUS-guided selective PV embolization on 9 animals are summarized in [Table 1]. 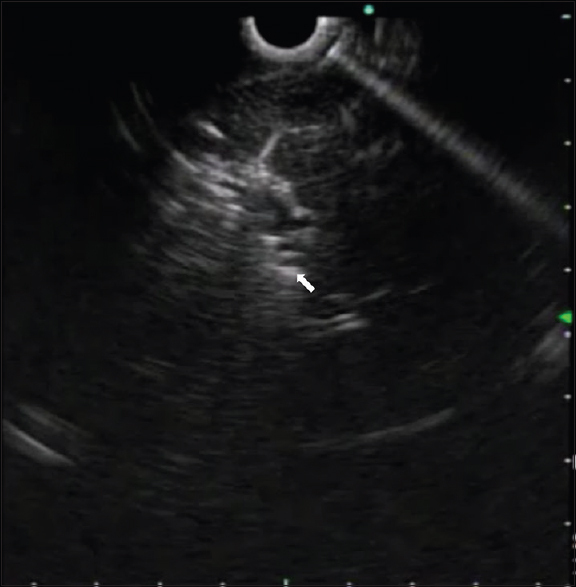 The baseline blood flow was evaluated using color Doppler EUS before conducting the intrahepatic PV puncture [Figure 5]. There was partial blockage of blood flow in the selected intrahepatic PV noted after inserting the embolization coil [Figure 6]. 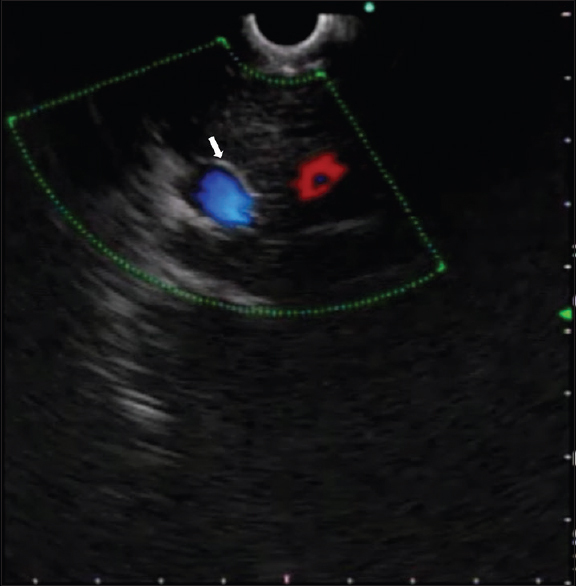 There was a complete blockage of blood flow in the embolized intrahepatic PV after both coil insertion and cyanoacrylate injection, and the result was confirmed by color Doppler EUS [Figure 7]. The necropsy was performed 1 week postoperatively. The embolized intrahepatic PV was totally occluded with an embolus consisting of the helical coil, adhesive cyanoacrylate, and thrombus [Figure 8]. The vital signs were stable during the endoscopic procedure in all 9 animals. There were no signs or symptoms of peritonitis and bleeding in the animals during the 1-week observation period. The necropsy was performed 1 week later, and there was no gross evidence of damage to the embolized intrahepatic PV, hepatic parenchyma, and intra-abdominal organs. The safety data for EUS-guided selective PV embolization on 9 animals are summarized in [Table 2]. Preoperative PV embolization has been widely used in clinical practice. It is an important procedure due to the beneficial effect of preventing postoperative hepatic failure in patients with hepatobiliary malignancy. Preoperative PV embolization is conventionally performed through the percutaneous approach. The EUS-guided intervention technique was recently developed, and the indications have expanded to include vascular therapy., There have been several attempts to evaluate the feasibility of EUS-guided vascular interventions, including transjugular intrahepatic portosystemic shunt, portal venous pressure measurement,, and main PV stenting. These indications have been conventionally performed by an interventional radiologist through the percutaneous approach. A human pilot study examining EUS-guided portal pressure gradient measurements was successful in all 28 patients with liver disease and showed no adverse events. There was an experimental report of EUS-guided PV embolization in 2005. One animal was involved, and the selected PV was punctured using a 22G FNA needle via the transduodenal route. The authors measured PV pressure before and after PV embolization. The embolization was conducted with 4 cc of Enteryx ® (ethylene-vinyl alcohol mixed with dimethyl sulfoxide). In this study, EUS-guided selective intrahepatic PV embolization was conducted in nine animals. We used permanent embolic agents including a 0.035 inch/14 cm coil and 0.5 cc cyanoacrylate and delivered the agents with a 19G FNA needle. The success rates of coil and cyanoacrylate delivery were 88.9% (8/9) and 87.5% (7/8), respectively. The complete blockage of blood flow to the embolized PV was confirmed by color Dopper EUS. There was one case of coil migration into the hepatic parenchyma. The necropsy findings indicated there was no evidence of damage to the embolized PV and intra-abdominal organs. In addition, the selected PV was totally occluded with embolus. The study has several strengths compared to the previously reported study. First, the 19G FNA needle was selected to insert the 0.035 inch diameter helical coil and adhesive cyanoacrylate. Furthermore, to prevent early clogging and leakage of cyanoacrylate we injected Lipiodol ® (ethiodized oil) after completing the cyanoacrylate injection through the same FNA needle. Therefore, sufficient embolic agents were delivered to the selected PV. The PV embolization was performed more effectively, which would be limited by a 22G FNA needle. Second, two types of permanent embolic agents including a pushed helical coil and adhesive liquid cyanoacrylate were used in this study. These agents are commonly used for therapeutic embolization in clinical practice.,, The adhesive cyanoacrylate (Histoacryl ®) has several advantages over nonadhesive ethylene-vinyl alcohol copolymer (Enteryx ®). The cyanoacrylate works instantly and completely occludes vessels. In addition, it is nontoxic and rarely causes vasospasm or vascular necrosis. Therefore, our method is a more practically preferred and favorable strategy for EUS-guided selective PV embolization. This study has several limitations. First, there was no assessment of liver volume change performed in this study. The primary aim of the preliminary study is to evaluate the technical feasibility and initial safety. Furthermore, 3-dimensional volumetric computed tomography or technetium-99 m-galactosyl human serum albumin scintigraphy  used for liver volume measurements in clinical practice is not available for animal models. The compensatory hypertrophy of the nonembolized hepatic segment can reach its maximum in 2–6 weeks after PV embolization in humans, and this was not confirmed in the current experiment. Thus, the final therapeutic effect of this intervention could not be evaluated. Second, the procedure was conducted in healthy animals without portal hypertension, coagulopathy, and biliary obstruction. As a result, the risk of procedure-related complications including bleeding and bile peritonitis can be underestimated. Further studies of portal hypertensive or biliary obstructive animal models are required to determine the long-term safety and efficacy of EUS-guided PV embolization. This experimental study indicates that EUS-guided selective PV embolization with a coil and cyanoacrylate is technically feasible and shows initial safety in a live porcine model. Further animal studies are required to reveal the long-term efficacy and safety. Kinoshita H, Sakai K, Hirohashi K, et al. Preoperative portal vein embolization for hepatocellular carcinoma. World J Surg 1986;10:803-8. Makuuchi M, Thai BL, Takayasu K, et al. Preoperative portal embolization to increase safety of major hepatectomy for hilar bile duct carcinoma: A preliminary report. Surgery 1990;107:521-7. Abulkhir A, Limongelli P, Healey AJ, et al. Preoperative portal vein embolization for major liver resection: A meta-analysis. Ann Surg 2008;247:49-57. Liu H, Zhu S. Present status and future perspectives of preoperative portal vein embolization. Am J Surg 2009;197:686-90. Rameshbabu CS, Wani ZA, Rai P, et al. Standard imaging techniques for assessment of portal venous system and its tributaries by linear endoscopic ultrasound: A pictorial essay. Endosc Ultrasound 2013;2:16-34. Weilert F, Binmoeller KF. EUS-guided vascular access and therapy. Gastrointest Endosc Clin N Am 2012;22:303-14, x. Levy MJ, Chak A; EUS 2008 Working Group. EUS 2008 Working Group document: Evaluation of EUS-guided vascular therapy. Gastrointest Endosc 2009;69:S37-42. Paik WH, Choi JH, Seo DW, et al. 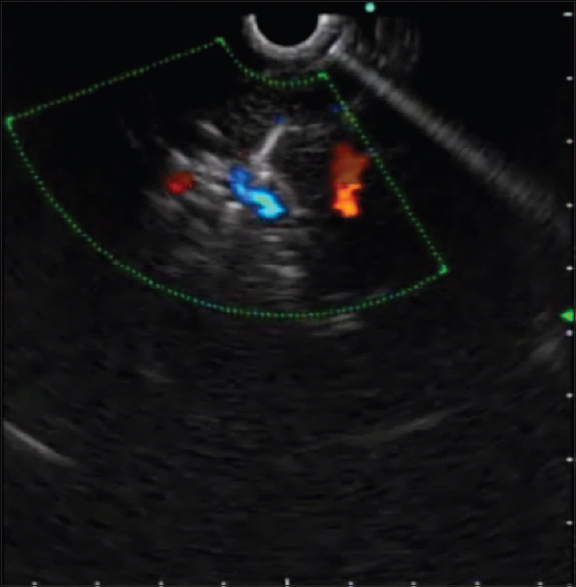 Clinical usefulness with the combination of color Doppler and contrast-enhanced harmonic EUS for the assessment of visceral vascular diseases. J Clin Gastroenterol 2014;48:845-50. Brugge WR. EUS is an important new tool for accessing the portal vein. Gastrointest Endosc 2008;67:343-4. Park TY, Seo DW, Kang HJ, et al. Endoscopic ultrasonography-guided placement of a transhepatic portal vein stent in a live porcine model. Endosc Ultrasound 2016;5:315-9. Yamakado K, Tanaka N, Nakatsuka A, et al. Clinical efficacy of portal vein stent placement in patients with hepatocellular carcinoma invading the main portal vein. J Hepatol 1999;30:660-8. Buscaglia JM, Dray X, Shin EJ, et al. 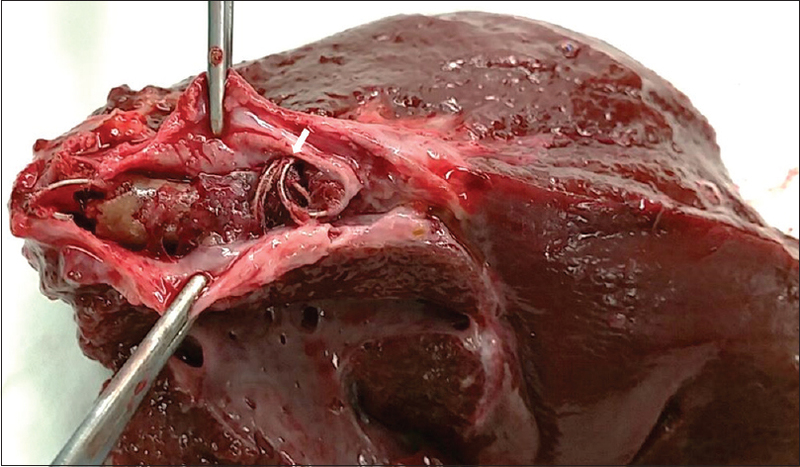 A new alternative for a transjugular intrahepatic portosystemic shunt: EUS-guided creation of an intrahepatic portosystemic shunt (with video). Gastrointest Endosc 2009;69:941-7. Schulman AR, Thompson CC, Ryou M. EUS-guided portal pressure measurement using a digital pressure wire with real-time remote display: A novel, minimally invasive technique for direct measurement in an animal model. Gastrointest Endosc 2016;83:817-20. Matthes K, Sahani D, Holalkere NS, et al. Feasibility of endoscopic ultrasound-guided portal vein embolization with enteryx. Acta Gastroenterol Belg 2005;68:412-5. Wallace S, Gianturco C, Anderson JH, et al. Therapeutic vascular occlusion utilizing steel coil technique: Clinical applications. AJR Am J Roentgenol 1976;127:381-7. Pollak JS, White RI Jr. The use of cyanoacrylate adhesives in peripheral embolization. J Vasc Interv Radiol 2001;12:907-13. Raffi L, Simonetti L, Cenni P, et al. Use of glubran 2 acrylic glue in interventional neuroradiology. Neuroradiology 2007;49:829-36.